I am trying to modify extensions.conf so that I can manually configure Asterisk. Please advise where asterisk files are located. Users / location of Mythtv directory in Linux MCE?? This may solve my problem of not having sound in MythTV Live TV. 1. Live TV is fuzzy - but still can see the show. (To isolate the problem, since I am thinking it might be my cable provider's issue, I booted my system using Windows Vista MCE - that is same hardware, and Live TV in Vista is very very clear). Thus, I am still having problem with the driver. Is there any other setup I need to do? I did some change in MythTVbackend and Mythtvfrontend. 2. I have no sound on Live TV...Other features of Linux MCE like watching DVD, music do have sound. Any help or idea? Thanks. Users / CX23880 Analogue TV Tuner, cannot be recognized by MythTV/LinuxMCE? Kword TV Tuner has been installed and looks like it has been autodetected. However, MythTV cannot recognize it. [ 37.811272] cx88: version might help as well. (since my card is a Kworld MCE 200 Deluxe), but still I cant solve this problem. I have successfully installed linuxmce. However, I am having problem with sound. That is, no sound at all even at AV wizard. I tried to adjust volume also using "alsamixer" but still i cant have sound. Users / Scanning DVB-C Channels? This wiki outlines how to scan channels for DVB-T and S, anyone can help on how to scan DVB-C Channels? Users / Linux MCE and Squeezebox integration? Currently, I have a squeezecenter running on CentOS and would like to migrate everything to Linux MCE. 1. Is it same to assume that squeezecenter has been integrated in Linux MCE? 2. Can Softsqueeze be loaded as well? Reason being is that I would like to just play the music using the speakers attached to the Core or Hybrid PC. Users / HP Proliant ML115 - is this powerful enough for a CORE? Is the specs of HP powerful enough for a CORE with 4 MDs? I will add 1 more NIC and eventually, 4 more HD for Raid5. Please advise if this is already a good powerful CORE. For those who have experienced using PLCBUS with MCE automation, appreciate if you can advise if its compatibility. Will there be any installation issue with MCE? The reason I asked is that PLCBUS is not mentioned and the wiki and would like to ensure that there will be no problem, if I purchase the PLCBus devices. I have an existing Asterisk installation running on CentOS 4.6. Do you have any idea on how to interface the existing asterisk installation? We use Ubuntu's package of asterisk with few addons and custom packaged AMP. 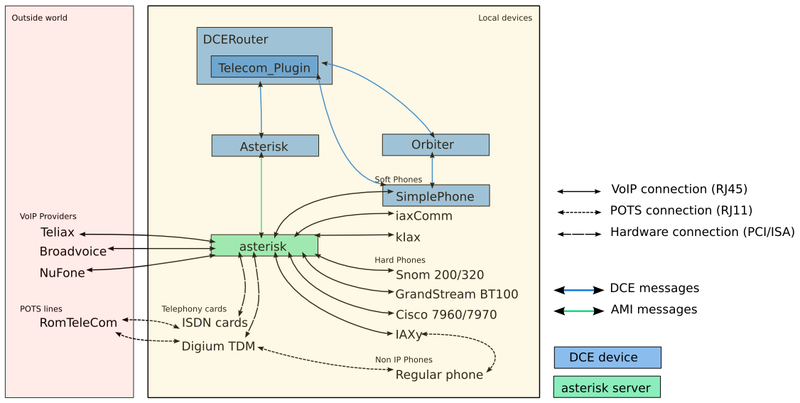 If you already have your own Asterisk installation running, you should be able to run the LinuxMCE Asterisk DCE Device against it. Fort those who have experienced integrating existing Asterisk installation, appreciate your advise. Users / Is ADSL fully supported in 710? I have read in Wiki that ADSL is not fully supported yet in Linux MCE (with post date of Nov 2007). However, with the recent release of 710, is ADSL fully supported? How many feeds can 1 TV tuner accommodate? I am currently a Vista MCE user and having only 1 TV tuner, obviously, will allow only 1 LIVE TV viewing OR 1 on-going recording. Since I am planning to setup a CORE server to service 4 rooms, I am planning to install 4 TV Tuners in the CORE server. THis is to allow 4 rooms to watch simultaneous TV should my kids prefer it. Also, hopefully, this setup will allow that 1 media director can do the recording while others 3 Media directors can watch live TV. Is this possible? or 1 TV Tuner in LinuxMCE be able to accommodate several channels, ie feeds, at the same time. A question from a LinuxMCE noob.